People love to remember The Evil Dead as being a comical kick off to the long-lasting franchise. When it’s pointed out that it’s not as played for laughs as the clearly over-the-top Evil Dead 2 and Army of Darkness were, fans and critics always like to go back and say that the first Evil Dead is funny because of its limited budget and resources and that it is not actually supposed to be fun. Both scenarios involve people who just want to laugh at the original Evil Dead because they know they’re supposed to laugh at the rest of the series. I’m not saying it’s not regarded as a classic. Of course it is and it always will be. But with so many new fans discovering older horror through Netflix and other streaming services, there are many flicks that seem to get a fairly positive reaction from the next generation of horror fans, but Evil Dead doesn’t seem to be one of those pictures. When you hear people—mostly people my age, admittedly—talk about the original Evil Dead, they immediately put it in the realm of a “so bad it’s good” cult classic. It’s interesting to see that reaction, but it’s also really weird, because people are talking about this movie as if it has no actual filmmaking merit even though that could not be further from the truth. Even fans of it tend to either concede its campiness or say that the unintentional humor is part of its charm. That, or they say that there is humor and it just goes over everyone’s head. Both parties are wrong. While the original holds a very high score on Rotten Tomatoes, a lot of fan reviews echo the apparent sentiment that it’s an amateurish thing that doesn’t rise above its lack of budget. When people ask “What’s the most overrated horror movie” Evil Dead is always one of the first titles I see someone reply with. Even some of the positive fan reviews on Rotten Tomatoes say it’s amateurish and point out bad acting, saying it’s sloppy and full of cheap scares, but that it helped people’s careers. Here’s the thing about The Evil Dead: The reason it’s held in such high regard thirty-five years later is because it works. Of course it’s as campy as anything with a $300,000 budget is apt to be, but it easily holds up better than most horror movies of its era. 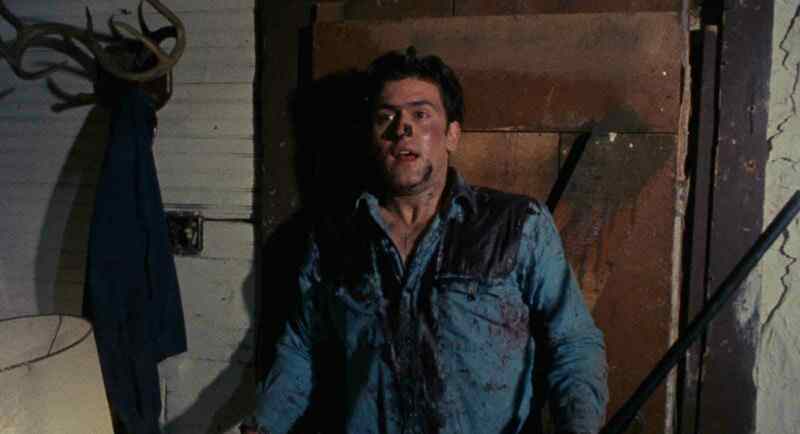 Evil Dead holds up for the exact same reasons that both Texas Chain Saw Massacre and Halloween hold up: its simplicity. The Evil Dead is horror in its rawest form. There are no padded out, unnecessary subplots. There is nothing in there that doesn’t need to be. All of the fat is trimmed in this movie and from the moment you start watching it, it’s clear that Sam Raimi has one goal, and it is purely and simply to scare the hell out of you. I think we tend to forget how scary the original Evil Dead actually is because when we think of the franchise, we think of Ash. We don’t think of Ashley, the mousey final guy we’re introduced to here. We think of the loudmouth, oafish hero he becomes over the course of the series. Ash changes so much as a character that I think it’s hard for a lot of people to relate him back to the original film. Hell, Army of Darkness is its own cult classic apart from the Evil Dead series. That’s the Ash that people know and love and that’s what they think of when the title pops into their heads. They don’t actually think of the original movie. In one way, that speaks to the impressive growth of this franchise over time. It shows that Evil Dead was never tied down to just being one thing and that both Sam Raimi and Bruce Campbell were never interested in repeating themselves. But it doesn’t help to keep the original alive and intact in the collective memory of the horror fandom. The original feature is raw and visceral. Raimi and company knew they were going to have to knock it out of the park and create something truly memorable if they wanted to make an impression with their debut film, so that’s exactly what they did. It tackles just about every kind of horror scare at once. It’s frightening because the characters are isolated and you don’t know how they’re going to escape the situation. It’s scary because this evil is an invisible one and could take them over at any time, you never really know who is possessed and who isn’t. It’s scary because the only way out of this situation is to hack up your girlfriend and your best friends. There are jump scares, slow-burn scares, and buckets of gore. This is the Forrest Gump shrimp monologue of horror movies. I’m almost thirty and have seen Evil Dead probably more than one-hundred times in my life, but there are still moments that genuinely creep me out—white-eyed Linda’s nursery rhyme—and make me squeamish—the pencil through the Achilles tendon. Evil Dead is purely and simply what it was designed to be: a roller coaster ride. There are a lot of horror films that pass themselves off as promising to be that and I think Evil Dead is what they should all look to as an example. As Rob Galluzzo pointed out in his comparison piece, while Evil Dead 2 and Army of Darkness almost feel like their own franchise, Evil Dead and its remake have so much in common. It’s because of that very fact that I wish fans, especially newer ones, would go back and give the original a look. Of course it’s not for everyone, nothing ever is. But it’s one of the most finely crafted, ambitious horror films ever made. Every ounce of effort they put into it is clear on the screen. That’s a huge part of what goes into making a low-budget feature into a long-lasting masterpiece. And at the end of the day, that’s exactly what The Evil Dead is.